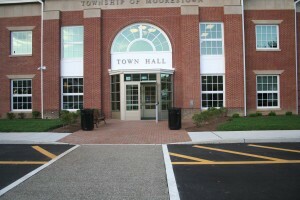 Some major projects are soon to be started and awarded in Moorestown. Town Council unanimously approved two ordinances on first reading, one for the reconstruction of the Second Street municipal parking lot and the other for the reconstruction of the hockey rink at Wesley Bishop Park. Both, if approved on second reading, are planned to start during the summer. Moorestown’s new engineer, Bill Long of the Alaimo Group, who replaced Jim Ruddiman after he retired, spoke on both of the projects during his report to council. The reconstruction of the Second Street municipal parking lot received a bid of $970,000 from Ricky Slade Construction. From the ordinance, $1 million is being appropriated for the project. This includes new curbing, piping, tree removal and any other details related to the complete reconstruction of the parking lot. The reconstruction of the hockey rink at Wesley Bishop Park was bid for $341,000 also by Ricky Slade Construction. A total of $150,000 is being appropriated for the project, according to the ordinance. As part of that project, the dasher boards that are removed from the hockey rink will be repurposed for the hockey rink at Jeff Young Park. The township received a $250,000 grant to put toward work on the hockey rink project, and $80,000 is pledged from the Moorestown Youth Hockey Association. According to Long, the estimates for both projects from Ricky Slade Construction came in lower than what was predicted. Long also said the construction for the parking lot went as high as $1.3 million. Long was expected to issue recommendations for these projects last week. Once awarded and approved by council on second reading, the Second Street municipal parking lot reconstruction is expected to begin at the end of June or early July and be finished by the end of summer. According to Long, the parking lots will not be completely closed, as workers and shoppers will need to park, and will be done in sections. Construction for the hockey rink would begin after the summer season concludes around Aug. 1. The second reading and final approval of these ordinances will be at the next council meeting on May 23 at 7:30 p.m. with a 7 p.m. workshop. Long also gave updates on many other projects being done or to be done in the township. Those include the annual report for storm water management, which was submitted and not expected to have any issues; a grant awarded from the Department of Transportation for improvements on Borton Landing Road; Memorial Field improvements; the library and town hall complex, which has a list of items that need to be repaired, and some items that have been addressed; the old library demolition, which is almost complete, with three light poles still needing to be put in; and bike lanes for Pleasant Valley Avenue that will be added on one side from Route 38 to the municipal boundary. • Two ordinances on first reading were tabled last week, one for the purpose of purchasing equipment for the temporary treatment at the North Church Street Water Treatment Plant and one for the preliminary engineer and design expenses for the upgrades at the Church Street plant. According to Mayor Phil Garwood, as there has been no final direction from the Department of Environmental Protection on the projects, council feels it is best to wait to hear back from it. Township Manager Scott Carew said the township is led to believe that approvals will be coming soon for the temporary treatment. • An ordinance on second reading was unanimously approved, establishing a cap bank. • Deputy Mayor Victoria Napolitano announced Moorestown was named the №1 top town for 2016 in South Jersey by South Jersey Magazine.